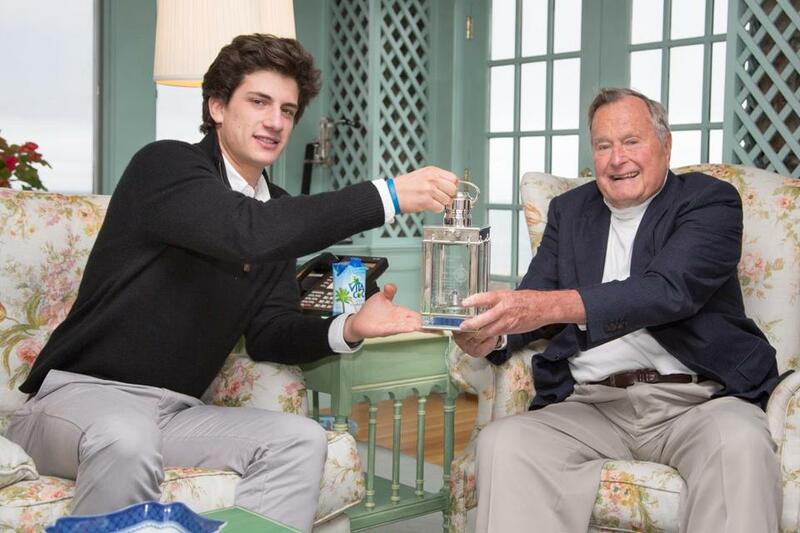 Jack Schlossberg presented the Profile in Courage Award to George H. W. Bush in Kennebunkport, Maine. Former President George H.W. Bush was presented with a political courage award at his home in Kennebunkport, Maine, on Tuesday, about five months after his granddaughter accepted the award on his behalf at the official ceremony in Boston. Jack Schlossberg, President Kennedy’s grandson, presented Bush with the John F. Kennedy Profile in Courage Award for his 1990 budget compromise, a decision that was a stark contrast to his 1988 campaign promise to not raise taxes, according to a statement from the John F. Kennedy Library Foundation. The award is given each year to public servants who have made politically courageous decisions without regard for personal consequences, the foundation said. Bush’s 1990 decision to raise taxes as part of a bipartisan deal after he famously promised he would not and told voters to “read my lips: no new taxes” seriously affected his standing with his Republican constituency and contributed to his loss in the 1992 election. “Candidly speaking, my grandfather didn’t want to raise taxes in 1990, but in our constitutional system of governance Congress also gets a say, and besides that, he felt he owed the American people action and results,” Bush’s granddaughter, Lauren Bush Lauren, said upon accepting the award on his behalf in May. The agreement set spending limits and raised taxes, and aimed to cut the deficit by $500 billion over five years. Since it was enacted, Bush, 90, has been credited with laying the foundation for the budget surpluses experienced during Democrat Bill Clinton’s presidency. The award is fashioned to look like a lantern or a “beacon of hope,” the foundation said. Paul W. Bridges was also honored with the Kennedy award in 2014, the foundation said. The former mayor of Uvalda, Ga., earned the award for risking his career by publicly opposing a controversial immigration law in Georgia.